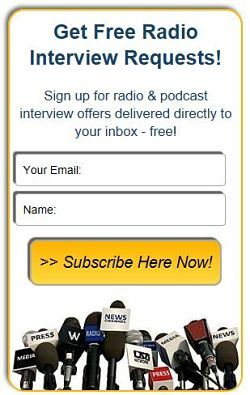 Podcast and Radio Shows: How to Get Guests to Interview - Radio Guest List.com - How to Get Radio Interviews and Find Podcast Guests! Finding guest experts and celebrities to interview “on the air” for your podcast is easier than it used to be. We recommend visiting http://www.FindRadioGuests.com. It’s a free service that any podcaster or radio host (or even bloggers or other journalists) can use to find experts in any field. Just submit the quick "Guest Request" form here and you can request experts of any type. The site’s parent service, RadioGuestList.com, will email your Guest Request out to its worldwide audience of experts, authors, marketers, celebrities, and other publicity seekers. Then you’ll get emails from qualified experts and public relations firms from all over! Instead of you chasing them, the experts will pitch you to offer the information and entertainment you’re seeking for your show’s talk radio and call-in interview segments. You can be as specific as you'd like when requesting guests for your show. You can even use the Guest Request service multiple times each month if you want to find podcast guests to discuss specific topics or you are covering breaking stories where repeat interview bookings of qualified experts are needed. Your podcast audience will love your new guests and www.FindRadioGuests.com will save you a ton of time finding podcast guests, too.